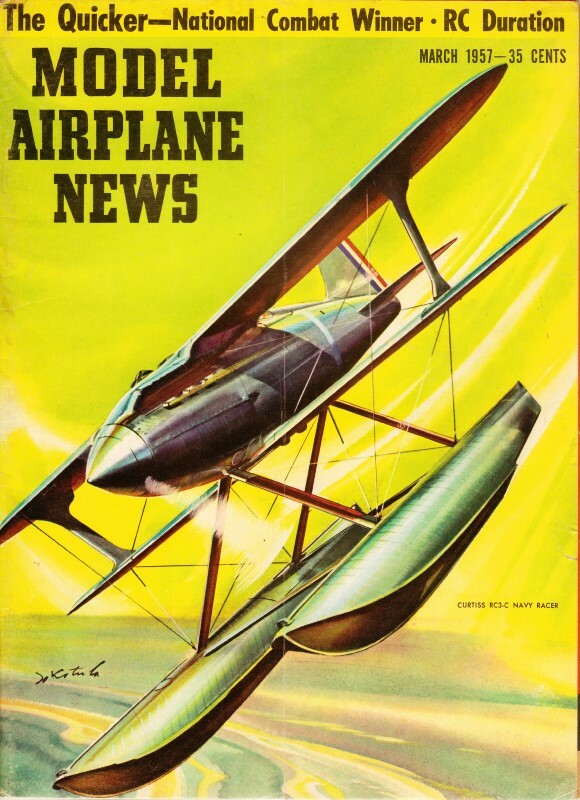 It would be interesting to do a side-by-side comparison on what was considered engineered control line stunt model airplane design in 1957, when this article was written, to what is today considered to be optimal design criteria. I am trying to get back into control line stunt flying and have one model built currently, the Enterprise-E. It has been flown a few times and is (was) extremely sensitive on the controls when set up per the plans. A little bit of control handle movements resulted in a huge amount of both elevator and flap deflection. Fortunately, access to the flap control horn is available through the removable top fuselage hatch, so I was able to relocate the pushrod from the bellcrank to the flap horn, and then from the flap horn to the elevator control horn. Overall throws are a little more than half what they were, so once the weather clears, I'll try the new configurations. The information in this article will be helpful when working out how to set up the Shark 15 control line model I am building right now. The Enterprise-E is equivalent to a 35-40-size glow fuel stunter and has a built-up fuselage. The Shark 15 has a profile fuselage and a completely accessible control setup, so I plan to leave the Enterprise-E hanging safely on the wall whilst the Shark 15 re-introduces me to the fine art of control line stunt. The Shark 15, BTW, was my first-ever non-Cox control line model airplane as a kid, so for the sake of nostalgia I am building one from original plans in a kit I bought on eBay a while back. It is using a 10-size brushless motor setup rather than the Fox .15 the original used. This is tough going but digging diamonds also is tough. If the long-haired stuff is too deep, the recap at end will prove worth studying. by W. F. Netzeband, Jr.
Corsair, left, a Sterling kit with Fox .59 and proportionate throttle operated from a Roberts Flight Control System. Top 90 mph, low 25 mph. Sea Dart, right, bit of mystery but sports a spinner. Flaps are a must for the modern stunt ship for several reasons. They increase the lift when it is most needed, by copious amounts. They allow us to use thinner airfoils for level flight, which cuts down the possibility of hunting, and decrease the sensitivity to lift changes caused by wind. One detrimental affect is causing the center of pressure to move aft when they are depressed, resulting in nose heavy trim. This is corrected by using larger, more effective elevator action as we will discuss later. As for size and shape, size depends on wing chord. The author prefers to start with a wing area and add the flaps to it. The chord of the flap is: CL = 0.20C, where C is wing chord. Flaps for our wing would be 1.8 inches wide. It has not proved best to run flaps full span, since they cause excessive wobbling laterally due to burble and increased lift at the wing tips. Therefore, flaps should taper in width from root to tip or simply not run full span. Amount of taper is arbitrary. A criterion for smooth flying is to have the wing tips stall last. 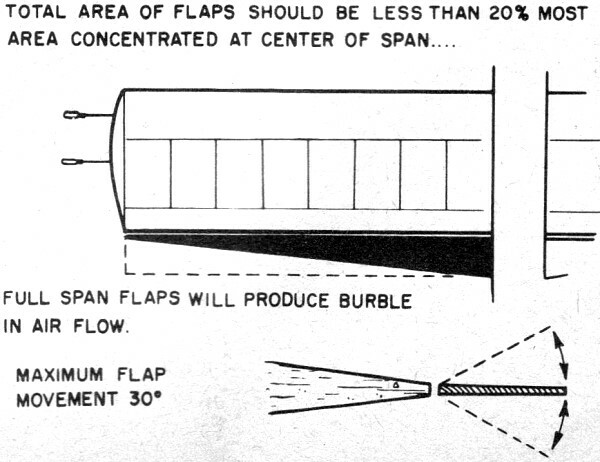 With flaps, an airfoil stalls at lower angles of attack than without; around 8 degrees compared to 10 degrees with a 12% thick section. By reducing the flap size, and hence the effect toward the tip, we accomplish this aim. In keeping with the style five years ago, this author's original used a thick wing section, won a few meets, but not exceptional. But an 18% section on this Palmer design gave good pattern at a 60 mph speed, squared well. Span was 52 in. and flaps utilized. It should be apparent that the closer to the fuselage we develop our center of lift, the lighter we can build our wing and we are less apt to have tip wobble. Tapered flaps, tapered or elliptical wings and other tricks are used for this. Maximum deflection should be 30 degrees and can be as little as 10 degrees. These depend on several factors which will be brought out gradually. 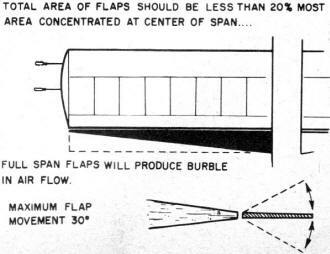 Total area of flaps compared to wing area should be less than 20% with most of the area concentrated in the center portions of the span. Distribution of area hasn't appeared to need mathematics yet. Too many variables are involved. 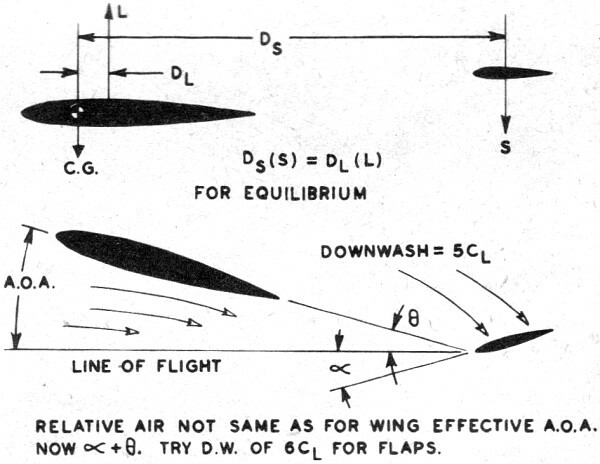 In order to compare characteristics, total weight is usually treated as weight per unit area for the wing. This enables us to use data gained in tests. Simply stated, a heavy airplane with a large wing will turn the same as a light airplane with a small wing, if their wing loadings are equal. Through experiment and experience the following are considered the best range of wing loadings for flapped wings and normal wings: with flaps - 0.05 to 0.10 oz./sq. in. ; without flaps -0.05 to 0.07 oz./sq. in. The 0.10 oz./sq.in. would give a 50-ounce airplane for 500 sq. in. Lower figure is a minimum practical limit. Some have exceeded this with featherweight combat ships, but not many. For the present we are ignoring the flying wing for stunt use. 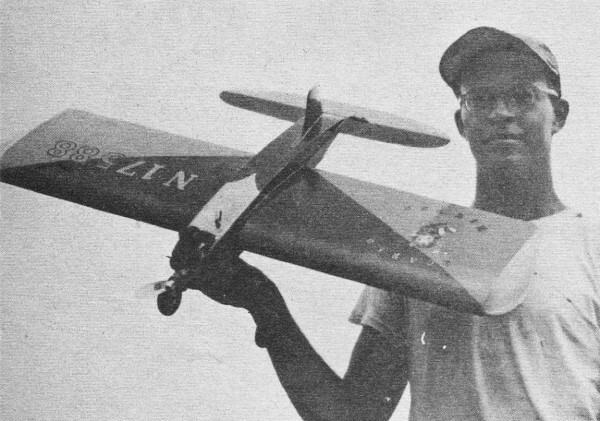 Harold Reinhardt is the only one, to our knowledge, who has won a big meet in stunt with a wing. Mr. Reinhardt is also a superb flier. We are studying the possibilities of this shape, but are not far enough along to make firm decisions. So, the stabilizer is still required. For those who are in doubt as to why the stabilizer, it does what its name implies. Stabilizes the wing. Through the elevator it controls the wing's angle of attack, hence controlling the flight attitude of the airplane. We balance the airplane ahead of the center of lift and bring the system to equilibrium by causing the stabilizer to generate a down load. See Figure 3. Most symmetrical airfoils lift at the 25% location as previously mentioned. Therefore, always locate the CG forward of this point. When we want to climb we give "up" elevator which increases the down lift of the stab. The wing then starts to balance this change. It begins to increase its angle of attack until it balances the stabilizer load. In doing this, it generates more lift so the airplane seeks an attitude to balance the increased lift. Our model moves in a circle which we call the loop. In the formula consider, for the moment, DS as fixed. If we decrease DL; i.e., move the CG aft, it will take less force from the stab to produce a given change in lift. As we move the CG forward it takes a larger change in force to change L. This is the secret of sensitive and coarse control. The other method is to increase or decrease elevator area or motion. By placing our CG at 10%, or forward, we get coarse control or large motions of elevator are necessary to cause changes of attitude. If we balanced right on the 25% line we would find a very sensitive ship since, theoretically, zero force would move the wing. 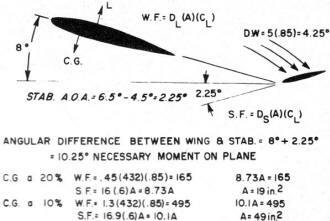 If we move the CG aft of the 25% line we must have positive force, or "down" elevator to control the wing. Free flighters are familiar with this through the use of lifting stabs. This condition fouls up the control-line ship for two reasons. First, any time we get a down load on the stab our ship would climb violently, in fact uncontrollably. Correction results in over correction and usually a splat. Second reason on stunt ships is the very low AOA in level flight. With aft CG, our stab is now lifting so wing lift must decrease or we'll climb. So we approach our zero lift angle and generally pass it, causing a quick dive since our system suddenly becomes way unbalanced. Again correction causes over-controlling and same end result. We tried this experimentally using a lifting stab on a team-race design. It proved to be flyable, but not too controllable, since it wandered up and down on it's own. This balance condition occurs in far too many cases of stunt and scale models. You recognize any of your ships here? C. G. will align itself along the line of restraining force. This does not depend on the bellcrank location. Bellcrank should be on C.G. for least resistance to motion. Note that lines will form an arc due to their drag which will make actual yaw angle less than if lines were taut. The reference point at the tip moves toward the line carrying the larger load. 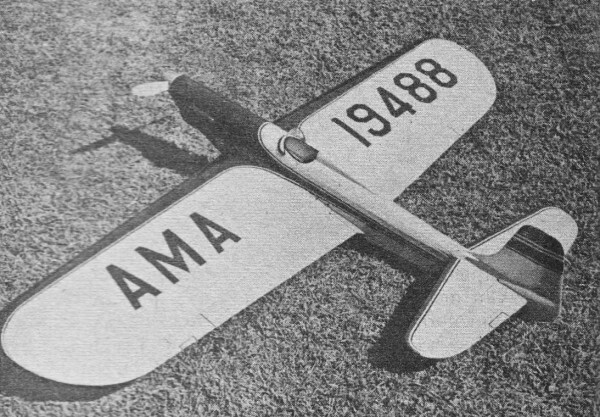 Relative air not the same as for wing effective A.O.A. now α + Θ. Try D.W. of 6CL for flaps. By moving the whole stabilizer we can predict the area necessary quite accurately, since it will operate as a wing. One thing which occurs as the wing's AOA is increased is a change in the angle of air over the stabilizer, called downwash. This is roughly 5CL or for a CL of 1 the downwash will be 5°. This downwash, shown in Figure 3, will make the stab more negative. With flaps there doesn't seem to be much information on downwash, but we suspect it is greater. Downwash must then be used to calculate stabilizer motions. To predict area we'll assume some constants, and add that a stab airfoil due to small chord and detrimental airflow characteristics will stall at around 6.5° and operate at 75% efficiency. Armed with our data on the average ship with a 16 inch tail moment arm and no flap we get this: See Figure 4. For this set-up we will need 10° deflection of our stab. Notice the extremely small stab here compared to our tremendous combination stab and elevators. In case any of you got lost in our math, we tossed out things that appear in both sides of the equation. Reason for small stab is a real sensitive trim. If we balance at 10%, our area would be 65 sq. in. See how important the old CG location is. We have been working with maximum lift on both wing and stab. If the stab is forced into a more negative angle, it will stall and lose download. We have then reached our minimum loop diameter and will probably open up a little. Ever have this happen to you? It is not the fault of the wing at all. Normal practice is to stay away from the 6° angle on the stab, but only work it 4.5°. We then have the ability to stall the wing, but at least we know what's doing it. You'll notice we worked on a smooth turn in our last go-round. Will this stab be good enough for a square turn or our old 5-foot radius? We did some mathematical playing around and found out it will. If we assume our wing can suddenly lift enough by virtue of flat-plate pressure increase, even though it's stalled, our present stab is quite capable of doing the job. The sharp turn depends on an abrupt over-controlling action rather than smooth increase. We more or less kick our wing loose from its normal attitude and the whole works goes ape. The loss of speed helps too. Anyhow, mathematically and practically, the stab from the above calculation is alright in a square turn. As for the standard set up of elevator and stab, they don't appear too efficient. We cannot accurately predict their action since at small angles they work as cambered airfoils and at larger angles as part wing and part deflection plate. We therefore must always make them too big. With flaps, our center of lift moves aft when depressed, which means our elevator must be larger than without flaps. So we fall back on an experimental value of 25% of the wing area and using an elevator chord equal to stab chord. Structurally the stab-elevator is simpler to build, while the problem of bearings and linkage make the stabilator or flying tail more difficult. Having tried one flying tail, we found that it is indeed much more effective than the conventional setup. For those who are interested in using a stabilator, would suggest pivot point on 25% chord so we have an aerodynamically balanced surface. Use a downwash of say 6CL for a flapped wing. Angular difference will tell you how far to move it both ways from zero. On stab-elevators we've found it best to limit motion to 30° and to adjust CG from test flights for best turns. More motion causes excessive drag, has­tens the stall of both surfaces and results in large variations in speed during ma­neuvers. The author has made close ob­servations of elevator motion in flight and has found that rarely does the elevator exceed 20° on ships which are trimmed properly. Those which do, perform stalled maneuvers which are sloppy and definitely not desirable in stunt. In considering wing shape we want to get the most work for a given area and still be able to get it into an automobile. This limits us to about 54 inch spans, unless you own a station wagon or hearse. The constant-chord wing gives us the largest wing area for a given set of dimensions, but the losses at the tip plus the tendency to wobble laterally make it undesirable. The tapered wing takes more work in design stages and building, while giving fairly good results in action. The elliptical shape is the ultimate in efficiency, and can be built up by using a few tricks to simplify layout and construction. It has proved best to maintain the flap hinges on a straight line for maximum smoothness of operation, although slight angles can be used if the flaps are connected with speedometer cable. Good material has already been presented on structures so we will only say we prefer the "D" tube leading edge because it gives a smooth section. The profile or the airfoil section is important but not too important. 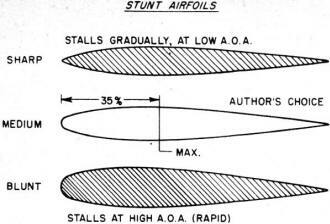 The author spent much time plotting airfoils the hard way, and comparing them to zip airfoils. We learned a few things. When drawing up a flapped wing the airfoil should be considered without flap, leaving the trailing edge thick enough to support the flap. Our own airfoils have the maximum thickness at 35% and use a medium leading edge radius. A sham-pointed leading edge will stall very gradually, but at a lower angle of attack than a blunt leading edge. The blunt airfoil will stall at a greater angle of attack, hence giving more maximum lift, but it stalls very sharply or sudden-like, which leads to surprise landings at three-foot altitudes and such. Therefore, the medium radius. 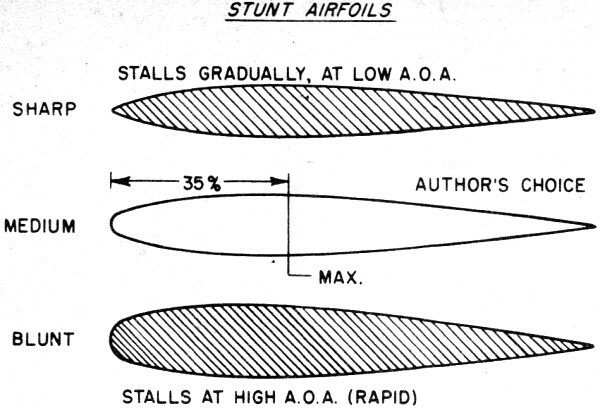 If you like to plot airfoils, the NACA four-digit streamlines are quite satisfactory. The NACA report No. 824 has a lot of interesting dope for those of your who want to delve deeper into this subject. We would recommend plotting a few airfoils to get used to their characteristics and then branching out and playing around. It's more fun that way. We've worked over the CG location pretty thoroughly already, but want to remind everyone that it's important. Much has been said pro and con about moment arms, long and short. Either can be made to work well if the CG is located properly and the stabilizer is of proper size to do its job. When starting a design from scratch, the CG location must be assumed in order to have something to base figures on. It must then be built into the model with a minimum of ballast which is only dead weight. In general, the long nose moment arm helps here. Weight in the aft end of the model must be kept at a minimum and structure should be carefully designed for lightness as well as strength. Stabilizer and elevator should be built-up rather than solid; on the larger ship, at least. If using sheet balsa keep thickness between 3/16" and 5/16" and use light medium-grain wood. Use "C" grain wood if possible. Watch your painting technique, being careful not to get the rear end heavy while finishing. Finish your model completely before flying. Most of your dope is added behind the center of lift, so your CG is moved back. This happened to us once with disastrous results. Experience alone will better your technique for building the CG into the proper location. But do not be afraid to add weight if it becomes necessary. Most of our modern stunt ships are too light anyhow. Think about that one for awhile. With U-Control we need tight lines to maintain control. There are several ways to guarantee ourselves enough tug at all times. Most important means, which we have never seen discussed as such, is the lead out location on the wing tip. Some designers seem to feel it's the bellcrank location. Not so. The CG will, like a plumb bob, try to a line itself along the line of centrifugal force, or on a radius of the circle. The center point of the leadouts becomes the pivot point. Therefore, as long as the CG is ahead of the theoretical pivot, as per Figure 5, the ship will yaw outward and give us our tug. As a formula we locate our bellcrank 1/4 of the way from the leading edge and slope the lines aft 5°. This assures a nose-out yaw. You could theoretically locate your bellcrank anywhere and not change the yaw angle, unless real stiff wire is used. Cables have proved to be best anyhow. The speed boys are finding that leadouts in line with CG give more speed, from decreased or zero yaw. While we are in this yawed attitude our fuselage is developing lift in the same direction as our centrifugal force which aids our tug. Be careful of this however, because, if excessive, it will cause wobbly turns and otherwise sloppy flying characteristics. If you plan to fly a slow ship on lines longer than 70 feet, increase the sweep back of the lines, since the natural bow in the lines will be greater. To get a rough idea of how your present ship yaws in flight hold it up by the leadouts; with a good tight grip, naturally, and observe the angle. It is expedient to bring the leadouts through the tip fairly close together, less than one inch apart. This decreases the tendency of the ship to change yaw angle as the load is shifted from one line to the other. Tug is affected by the bank angle of the ship. If banked into the circle, tug will be less, since the lift is no longer vertical but into the circle. If outboard wing rides low, the tug is increased in a like manner. The vertical CG location has a pronounced effect on the bank angle, so some thought should be given to layout of the side view. The low wing setup has proved to be the best compromise on this point. The landing gear balances the upper structure bringing the CG down around the wing for a fairly neutral setup. This presumes the leadouts are brought through the wing. We built one combat ship with everything above and below the center line balanced; and the engine laid on its side. This ship flew perfectly level laterally and was real nice to handle. Engine offset is very effective in controlling tug, particularly in overhead eights. Three degrees has been found the best compromise for this. You will always have your pure centrifugal force in level flight, but the effect is decreased as you climb on the circle. The forces and analysis of same are greatly complicated in control line due to operating in a hemispherical flight path. For the most part, detailed analysis proves little. Next month we'll prove plenty and get this show all wound up.